Fabricated from state-of-the-art carbon composite material, specially wound to offer the rigidity of steel yet lighted in weight than aluminum. Height adjustment range from intramurals to men's competition. Complete system includes 3-1/2" uprights with worm drive winch, Flex Net, Upright Padding and Antennae. Fabricated from state-of-the-art carbon composite material, specially wound to offer the rigidity of steel yet lighted in weight than aluminum. Height adjustment range from intramurals to men's competition. 3-1/2" diameter uprights. Jaypro's new top of the line, women's only competitive carbon volleyball system. Ultra lite and ultra strong! The 3-1/2" LadyPro upright weighs less than 18 lbs (under 21lbs with winch), which compares to aluminum uprights which can weigh as much as 40 lbs or steel ones weighing 60 lbs. Designed exclusively for women's volleyball with an official height of 7' 4-1/8" (2.24 meters). Comes with adjustable feet having up to 3" of fine tuning adjustment to achieve precise height during initial set up. Uprights are fabricated from state-of-the-art carbon composite material, which is wound to maximize rigidity, giving the stiffness of steel at a weight far lighter than aluminum. Uprights feature durable recessed polymer pulley wheel. System includes uprights with worm drive winch, patented Flex Net, upright padding and antennae. Floor sleeves sold separately. Specify pad color when ordering. The 3-1/2" LadyPro upright weighs less than 18 lbs (under 21lbs with winch), which compares to aluminum uprights which can weigh as much as 40 lbs or steel ones weighing 60 lbs. 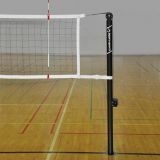 Designed exclusively for women's volleyball with an official height of 7' 4-1/8" (2.24 meters). Comes with adjustable feet having up to 3" of fine tuning adjustment to achieve precise height during initial set up. Uprights are fabricated from state-of-the-art carbon composite material, which is wound to maximize rigidity, giving the stiffness of steel at a weight far lighter than aluminum. Uprights feature durable recessed polymer pulley wheel. Fabricated from state-of-the-art carbon composite material, specially wound to offer the rigidity of steel yet lighted in weight than aluminum. Height adjustment range from intramurals to men's competition. Complete system includes 3" uprights with worm drive winch, Flex Net, Upright Padding and Antennae. Fabricated from state-of-the-art carbon composite material, specially wound to offer the rigidity of steel yet lighted in weight than aluminum. Height adjustment range from intramurals to men's competition. 3" diameter uprights. Jaypro's new top of the line, women's only competitive carbon volleyball system. Ultra lite and ultra strong! The 3" LadyPro upright weighs less than 18 lbs (under 21lbs with winch), which compares to aluminum uprights which can weigh as much as 40 lbs or steel ones weighing 60 lbs. Designed exclusively for women's volleyball with an official height of 7' 4-1/8" (2.24 meters). Comes with adjustable feet having up to 3" of fine tuning adjustment to achieve precise height during initial set up. Uprights are fabricated from state-of-the-art carbon composite material, which is wound to maximize rigidity, giving the stiffness of steel at a weight far lighter than aluminum. Uprights feature durable recessed polymer pulley wheel. System includes uprights with worm drive winch, patented Flex Net, upright padding and antennae. Floor sleeves sold separately. Specify pad color when ordering. The 3" LadyPro upright weighs less than 18 lbs (under 21lbs with winch), which compares to aluminum uprights which can weigh as much as 40 lbs or steel ones weighing 60 lbs. 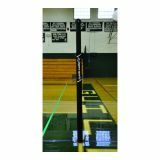 Designed exclusively for women's volleyball with an official height of 7' 4-1/8" (2.24 meters). Comes with adjustable feet having up to 3" of fine tuning adjustment to achieve precise height during initial set up. Uprights are fabricated from state-of-the-art carbon composite material, which is wound to maximize rigidity, giving the stiffness of steel at a weight far lighter than aluminum. Uprights feature durable recessed polymer pulley wheel.